A former UPS driver who sued the company for putting her on unpaid leave while she was pregnant has reached a settlement with the company after her case went all the way to the Supreme Court. An attorney for Peggy Young announced the resolution Thursday but didn't specify the terms. UPS said the parties had reached an agreement -- and said in a statement that a new UPS pregnancy accommodation policy implemented in January had helped the two sides settle. In March, the Supreme Court ruled in favor of Young, who was working as a driver for UPS in Landover, Maryland when she became pregnant in 2006. Young gave her supervisor a doctor's note recommending she not lift packages heavier than 20 pounds. Young said she dealt almost exclusively with overnight letters, but UPS said its drivers must be able to lift packages as heavy as 70 pounds. The company placed Young on unpaid leave. 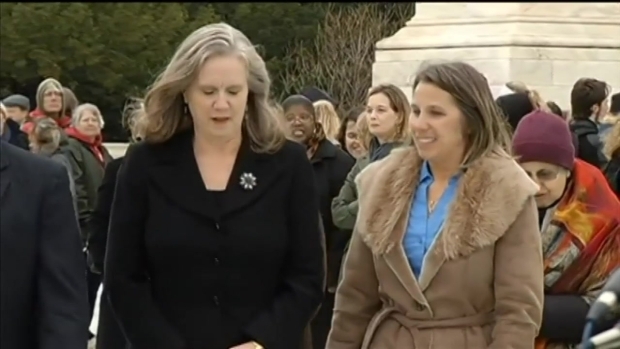 News4's Darcy Spencer was outside the Supreme Court where a crowd of people came out to support Peggy Young. As a result, she lost her health insurance, and couldn't collect unemployment because she hadn't been fired. So she took her fight to court. The Supreme Court ruled in favor of Young on March 25, sending the case back to a lower court. Young and UPS have now "reached an amicable resulation," Young's attorney announced Thursday -- nine years after the dispute arose. Young told News4's Darcy Spencer she was relieved to have a resolution. "I'm actually extremely happy that we've changed a lot of laws and stuff for pregnant women -- that they shouldn't have to decide between having a baby and working," she said. "I'm not a spotlight person, but I'm glad -- somebody had to stand up to a company that wasn't willing to follow the rules and regulations of letting pregnant women work." Young's lawyer, Sharon Fast Gustafson praised her client's committment. "Litigation is not for the faint of heart or the impatient," she said in a release. "Not many victims of discrimination would have had the grit that Peggy Young displayed in sustaining this struggle for nine years." "I was willing to work," Young has said. "I was willing to do my regular job, and they wouldn't let me, period.... We shouldn't be made to choose between our job and having a child." Young returned to work two months after her daughter was born, but left the company in 2009. She said she should have been offered light-duty work because some other UPS workers were -- including workers with injuries and workers who'd lost their driving privileges because of drunken driving. "UPS changed its policy because the company recognized that state law, regulatory guidance and the general work environment in the U.S. have evolved. UPS believes it is appropriate to update its workplace policies so that the company can attract and retain the best workforce. The new policy began last January. It strengthens UPS's commitments to treat all workers fairly and supports women in the workplace. "The new UPS policy makes temporary light duty work available to all pregnant employees with medically certified lifting or other physical restrictions. The policy reflects pregnancy-specific laws recently enacted in a number of states where UPS conducts business, and is consistent with new guidance on pregnancy-related accommodations issued by the Equal Employment Opportunity Commission last year." In response to the case, Maryland enacted the Reasonable Accommodations for Disabilities Due to Pregnancy Law in 2013. And in 2014, the EEOC issued new guidance on the Pregnancy Discrimination Act, increasing protections for pregnant workers, Fast Gustafon said. Young called the ruling a victory for her daughters' ability to work and have children. "They shouldn't have to choose, and no woman should," she said.